Christmas trees, arguably, are the single most popular form of Christmas decorations. Ask any group of Christmas Enthusiasts to choose just one must-have item of Christmas décor, and most are likely to choose a Christmas tree above all others. After all, Christmas just wouldn't be Christmas without a Christmas tree, would it? And some of those Christmas trees are B-I-G! Bigger isn't always better. But bigger can be quite spectacular. Each year, Rockefeller Center in New York City erects a massive Christmas tree. The tradition began in 1931 when a small balsam Christmas tree was displayed on the construction site of Rockefeller Center. The star that tops the tree weighs 550 pounds, and is made of 25,000 individual crystals and more than 700 LED lights. And even if you've never been to New York City, it's likely that you've seen a Rockefeller Center tree many times. That's because the iconic tree regularly finds its way into movies and television shows. For several weeks during the holiday seasons of the 1970s and 80s, a towering Christmas tree erected at the Palm Beach offices of the National Enquirer drew more attention than stories of alien abductions or 3-headed babies. That's because the owner of the tabloid, Generoso Pope, believed in going big when it came to Christmas trees. During that period, Pope regularly setup trees that soared to more than 100 feet in height. And for several Christmas seasons, Pope's trees won the Guinness Book of World Records title as the largest decorated Christmas tree for the year. One of those years, the record-holder was a gargantuan 120 feet tall! The yearly tradition came to an end with the death of Pope in 1988. But for nearly 20 years, people had nearly as much trouble believing what they saw outside of the National Enquirer offices during Christmas as what they read inside the pages of the tabloid. Every holiday season, London's Trafalgar Square plays host to a huge Christmas tree - a tradition of peace, gratitude and friendship, from the people of Oslo, Norway. Beginning in 1947 and continuing to this day, a Norwegian Spruce is selected from the forests surrounding Oslo and shipped to London each November. The trees have ranged up to 75 feet in height; last year's was 65 feet tall. The current record holder for the world's tallest Christmas tree can be found in Dortmund, Germany each holiday season. This tree stands nearly 150 feet tall! But there's a bit of a twist to this tree: This tree isn't 'a' tree; it's actually many trees - 1700 red spruce trees, to be precise. All of those individual trees are stuffed into a single gigantic-tree framework, and decorated with nearly 50,000 LED Christmas lights. Is it 'cheating' to create a record-holding tree from hundreds and hundreds of individual trees? Maybe, maybe not. But either way, it's one impressive sight! We're proud to tell you that some of those impressive trees you've seen might have been our very own. Because we sell some pretty impressive trees ourselves. It's our line of commercial Christmas trees, and they can rival in height all the trees listed above - except for the 'stuffed' tree in Germany. In fact, our commercial trees are available up to 100 feet in height. 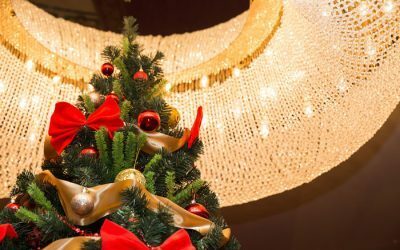 We also sell some great large-tree ornaments, and some enchantingly unique variations on the traditional Christmas tree look - our Tree of Lights, for example, and our LED Ice Trees. Our trees are manufactured, so each one that's sold helps to reduce the destruction of century-old living trees - an unfortunate consequence of many of the grand Christmas tree displays erected each holiday season. Unlike a living tree, which is a one-and-done proposition, our trees can be reused Christmas after Christmas, for decades. So the tallest, most impressive Christmas tree you ever saw? It just might have been a Christmas Designers' tree.